Getting married? Need a place to live? Linmarr Towers Condominium Complex "Tomorrow's Neighbourhood Today"
An elegant, generally all-white cake with an understated design. 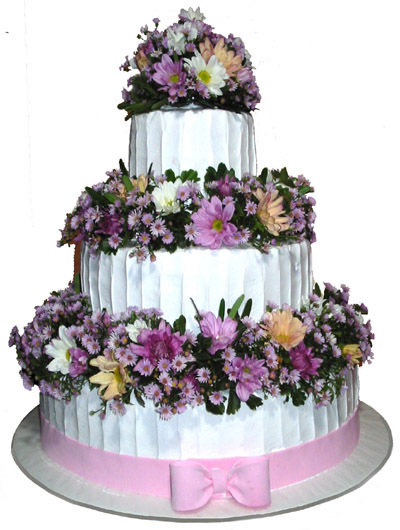 Flowers of sugar paste are popular accents, as are sugar-paste roses and lillies. 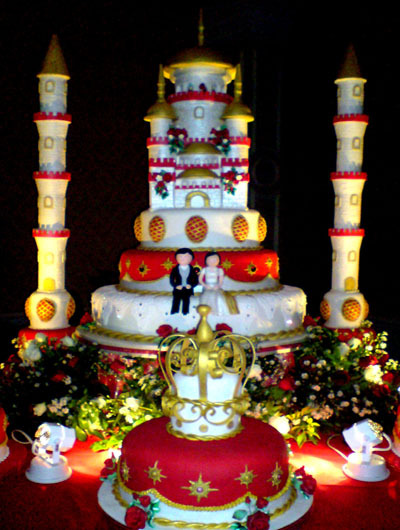 Typically, the cakes are composed of three-to-four-inch-high tiers (inside each tier are four layer cake). One common combo: citrus-vanilla-flavored cake topped with buttercream. No matter the icing you choose, the white color almost never varies, so don't try to match shade to your off-white gown. A no-fail pick: pearlized white, which emits a slight luster. 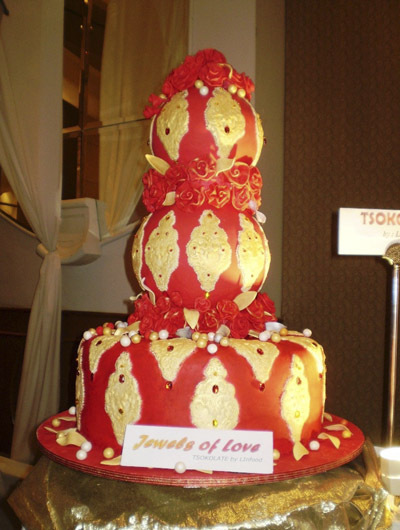 A hip take on the traditional cake-it's taller (tiers are four to six inches high) and design-heavy, with repeated patterns on the sides or the top. (The motif above is a royal wedding). Tastewise, these cakes are usually bold. You can ask for any design that piques your interest. 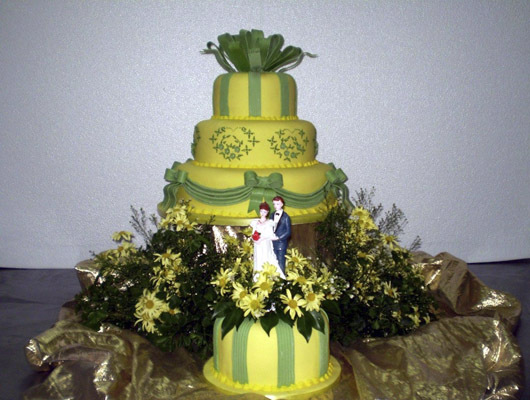 A baker can create silhouttes of butterflies, birds, flowers, and more by hand or with pastry cutters. A whimsical cake inspired by something sentimental-in this case, the embellishment on a gazebo. 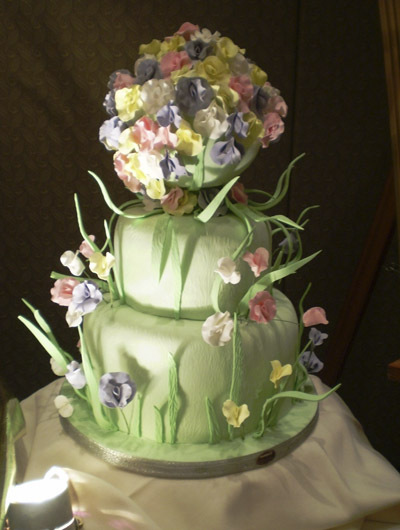 (Here, the baker used sugar paste to mimic Roses, leaves, and crawling plants.) Whereas modern cakes tend to feel structured, these are much less formulaic (note the flowing design and how the flowers grow naturally). Because these cakes are highly personalized, you'll need to work with the baker to develop a vision. Feel free to bring an inspiring photograph, a favourite quote, fabric swatches or even a beloved childhood storybook. 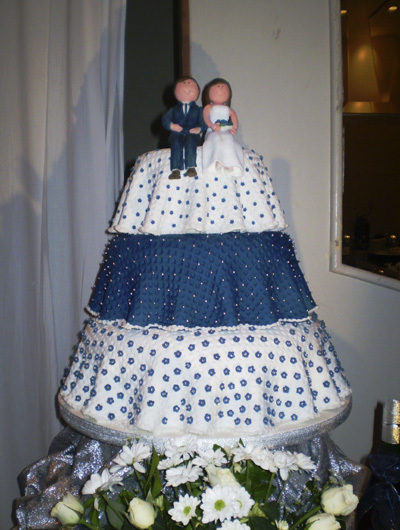 A laid back, creative alternative to the typical design extensive wedding cake. 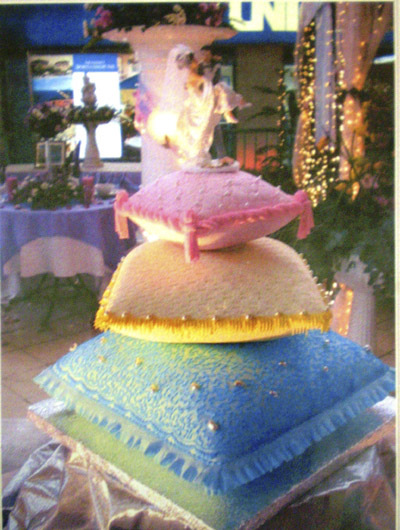 Here, a simple two-colored schemed cake evokes a playful mood and gives guests a sense of youth. 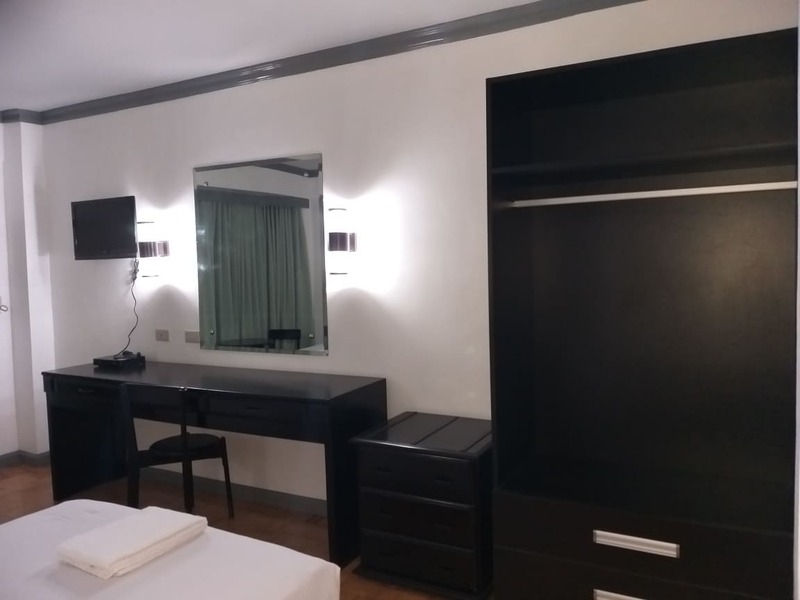 Usually, this choice is catered to close-knit friends and families who would enjoy and won't mind the informality. Also, take a peek at the recent wedding events that just happened at Linmarr. A wedding pictorial gallery you don't want to miss! Featuring thousands of pictures to inspire you (please allow time to load). 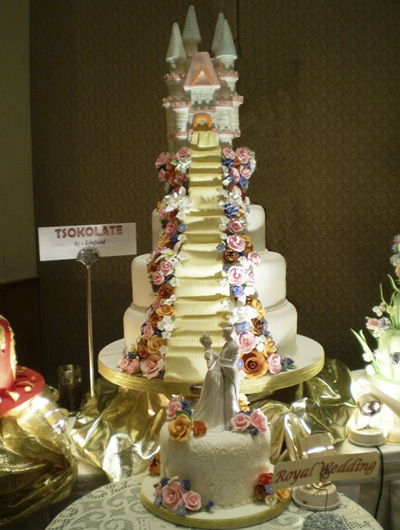 Here, you'll see the wedding cakes at their actual setting. Do we have to choose vanilla or chocolate cake? Mario sep, dili! (Sweet heavens, no!) You can have lemon, banana, or red-velvet cake, among many others. You are limited only to what your baker is willing to try-and a good baker should be willing to experiment. That said, don't go too flavor-crazy with the cake itself; the filling is often a better way to introduce a pet taste (mango, passion fruit). And steer clear of nuts (which are in almond cakes and often in carrot cakes as well), unless you're sure you have no nut-allergic guests. What are the options for frosting? There are a few types, all with a different look and taste. Buttercream: A generic term that refers to icing made with butter, powdered sugar, and flavourings. There are also versions made with shortening or a combination of shortening and butter. Meringue or mousseline buttercream: Smooth, creamy, and made with egg whites, this holds up well in hot temperatures, but it's time-consuming to make and therefore more expensive. 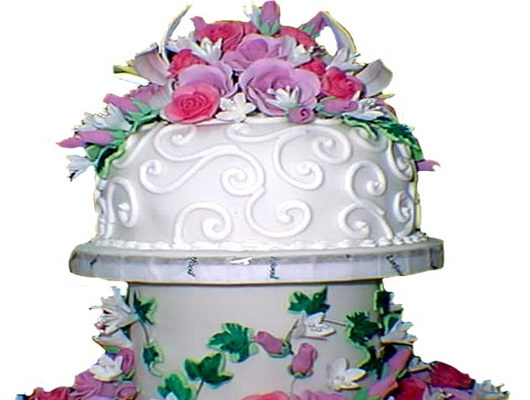 Fondant: A smooth sheet of sugar paste, this icing can be flavored and tinted different colors. It holds up well, but many people don't enjoy its chewy texture. So if you want to enjoy fondant for the look,ask about having a layer of buttercream underneath. What do we need to know about transporting our cake to the reception? Most bakers deliver locally and are skilled at it, so if you have that option, take it. If you're transporting the cake yourself, choose the filling carefully. A looser filling, such as mousse or curd, won't travel as well as a jam-based one. A layer of fondant on the cake adds extra protection. The cake should be refrigerated until the moment it leaves the baker's and afterward kept in a Styrofoam box on a flat surface. Should we serve guests the actual cake or order sheet cakes of the same flavor for them? 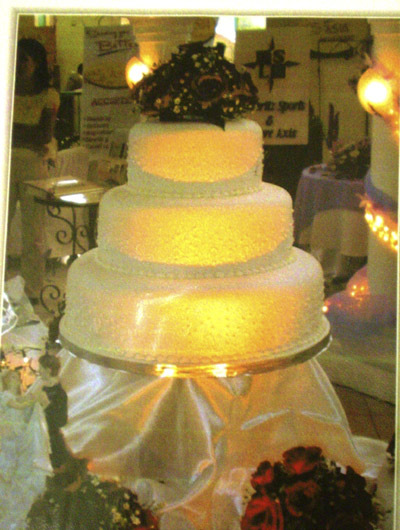 Some couples believe that a smaller display cake plus a larger sheet cake saves money, but that's not always the case. Say you have 200 guests. If you ask for a sheet cake for 100 and tiered cake for 100, the baker still needs to bake the same amount of cake. The only savings is in decorating time. That said, if your cake is truly elaborate, it will be less expensive to keep it small and offer a sheet cake for serving. But single-layer sheet-cake slices won't look the same on the plate as those cut from a tiered cake. We're having a beach wedding. What should we do about our cake? That depends on what your cake is made of. Avoid mousse fillings, which need refrigeration; opt for jam. If you choose buttercream icing, be sure it's made with a mixture of shortening and butter as opposed to just butter; the combination holds up longer without degrading. Of course, in a hot-weather setting, you might consider forgoing a cake altogether and offering something that is easier to keep cold, such as pies, cookies, or cupcakes. Is it a good idea to have other dessert options? A dessert bar, with everything from make-your-own sundaes to cookies, cakes, and pies. A chocolate fountain, which can be pretty expensive. An espresso or cappuccino bar. A cotton-candy machine -- lots of fun for the children. A "Sorbetero" that rolls into an outdoor reception, mid-dancing, as a refresher. Where should we display our cake? 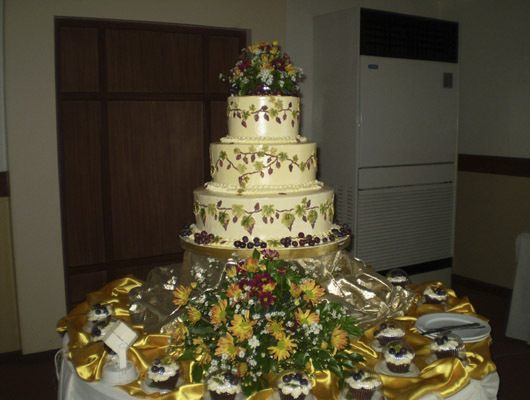 Many venues have a spot where they routinely display a wedding cake, chosen to showcase it and to keep it safe (in front of a mirror in a corner or near a picture window, for example). Make sure there isn't anything distracting in the background, like a fire extinguisher, or an exit sign that will show up in photos. And know that spotlights and sun streaming through windows can melt icing over time-particularly buttercream. If you don't want the cake where the site suggests, look around for a spot you prefer. One to avoid: the edge of the vibrating dance floor. Do we have to have a cake cutting? Well, no, you don't have to do anything. 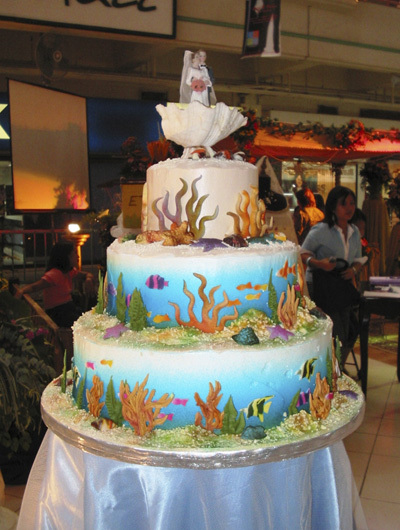 But if you have a cake on display, your guests are going to expect a little funfare. It is up to you whether to have a simple ceremonial slicing or to go all the way with a special song and mutual feeding. A bit of background: History holds that cake cutting is symbolic of the first joint task you undertake as husband and wife. Traditionally, the husband feeds the wife first. Any ideas for cake toppers? Borrow your parents' or grandparents' topper, or look at auction sites like eBay for a unique option. Inscribe your new monogram on the tiers in icing. Bundle some fresh flowers and arrange them on the top tier. Find a figurine or even a holiday ornament that reflects something you fancy. Place childhood photos in small lightwieght frames and set them on the confection. 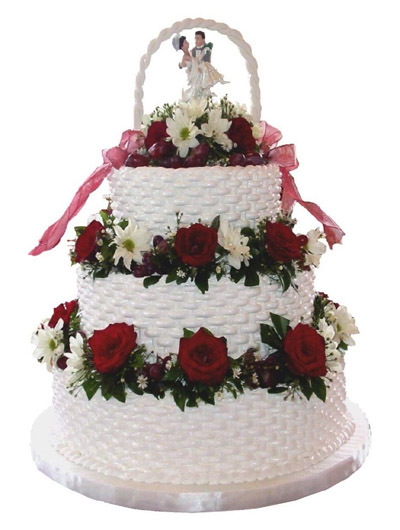 Ask the baker to create a bow out of fondant and place it on the top of the cake. 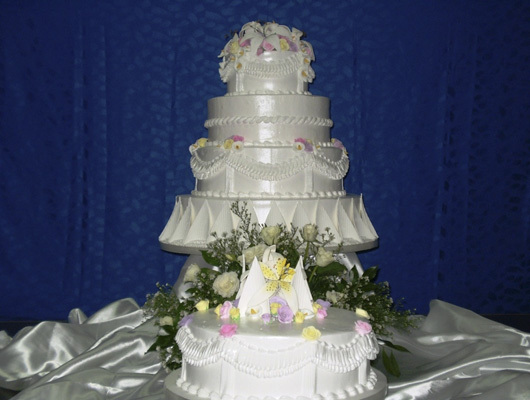 How do we save a slice or the top tier of our wedding cake? Wrap the slice in several layers of plastic wrap, then in foil. Put in a plastic bag, then squeeze out all the air. Place the bag in a cake box or a plastic container and freeze. Remove from the freezer a few days pre-anniversary and let it defrost in the fridge.